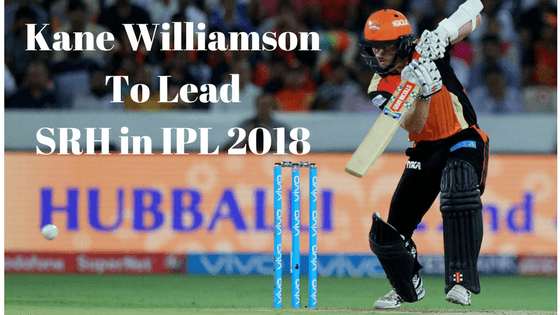 CEO of SunRisers Hyderabad K. Shanmugam announced the appointed of Kane Williamson as the captain of the team through the official twitter handle of SunRisers aftermath dismissal of Warner from IPL season. Showing gratitude to fans Williamson after accepting the post of leadership said “I’ve accepted the role to stand in as captain for this season. It’s an exciting opportunity with a talented group of players. I look forward to the challenges ahead”. Kane who is also serving as the captain of New Zealand lead his success in all three formats made him the perfect choice to fill the spot in IPL franchise. Kiwi skipper joined Hyderabad in 2015 that till date he scored 411 runs at an average of 31.62 in 15 matches inclusive of three half-centuries. While defending Warner aftermath ball-tampering scandal he passed the remark about the former “He’s not a bad person by any means,”. Now deputy Captain of Australian team will face repercussion by losing 12 crores from IPL and world-renowned Multinational electronics company LG backed out to sign further renewal contract. Many speculations surrounded about the captaincy of SunRisers when Warner was banned and one name that comes out was Indian opener batsman Shikhar Dhawan. If he would have opted as a skipper then in the history of IPL all the captains of the franchise would have been from the Indian team. Dhawan who is regarded as the front face of SunRiser most of the time, played a crucial role in 2016 when team lifted IPL trophy. In fact, during the tour to SriLanka recently in Nidahas trophy, Gabbar of team India was seen perfectly into the role of Vice Captain. Both SunRisers and Royals will face each other on 9th April at Rajiv Gandhi International Cricket Stadium with the new captain on each side while latter with Kane and former with Rahane. In the official Twitter account of SunRiser where #OrangeArmy is trending to extend support to their team with fans tweet for best wishes from all across the world. Tickets are available on www.sunrisershyderabad.in for all the matches played against sunrisers and apart from tickets they are offering jersey of their orange army. Rajasthan Royals while on other hand trending with #Hallabol in twitter account which also contains some videos and photos posted by their fans with Rajasthani flavor into it. To buy tickets for matches of Royals fans can book it from BookmyShow. Whole ball tampering incident not only affected Cricket Australia but also IPL franchises that were thereby not ready for this kind of expectancy. Earlier today Steven Smith broke down into tears by admitting his guilt during the press conference and Warner took the whole responsibility in ball tampering saga. Now Smith needs to serve voluntarily to community cricket for 100hours as a part of punishment assigned by Cricket Australia.